Why your previous purchasers could be your best source of instructions. A friend of mine – Helen – has recently moved house. It was a fraught time. She was on the phone to me a lot (naturally), complaining about her buyer and her agent. They were both dragging their heels, apparently, causing her unnecessary grief and anguish – deliberately, of course. “How was the survey?” I enquired, hesitantly. “Oh fine”, she replied, breezily. “Just a bit of rising damp and Japanese Knotweed – nothing to worry about”. Ok, I exaggerated for effect on that last bit, but I hope you get my drift. When you’re selling your house, everything seems to be stacked against you: the purchaser offers too low, the agent presses you to take it, the survey is full of bad news, the chain below you is troublesome, and so it goes on. However, when you’re buying your next home, it’s an entirely different story. Yes, there are hoops to jump through, but you jump with gusto and determination, motivated and excited by the prospect of moving into your new home. Human nature causes us to see things that we are trying to leave behind as a burden, a millstone around our neck. Our new home however, is something we are striving towards, reaching out for with a smile on our face. As a consequence, the estate agents that are involved in our transition become part of the problem, or part of the solution. In a vendor’s mind, any problem with a sale becomes the fault of their agent, whether it’s the survey, the buyer’s borrowing capacity or an issue with dates. On the other hand, in a purchaser’s mind, their agent is on side, helping and supporting them, taking that journey towards their dream home together. So how can we use this phenomenon to our advantage? Well the important point here, is that when looking for repeat business from vendors, turn first to your purchasers. They are much more likely to remember your input as favourable, and helpful. Someone who has bought from you is pre-disposed to trust you more, and pay a proper fee for your services, than a disgruntled vendor who eventually had to sell at 20% below their asking price years ago. (Even it is was because they hadn’t disclosed it had been previously underpinned.) Past purchasers can be so much easier to work with because they come to you with trust and liking, so the relationship starts off on a much firmer foundation (pun intended). 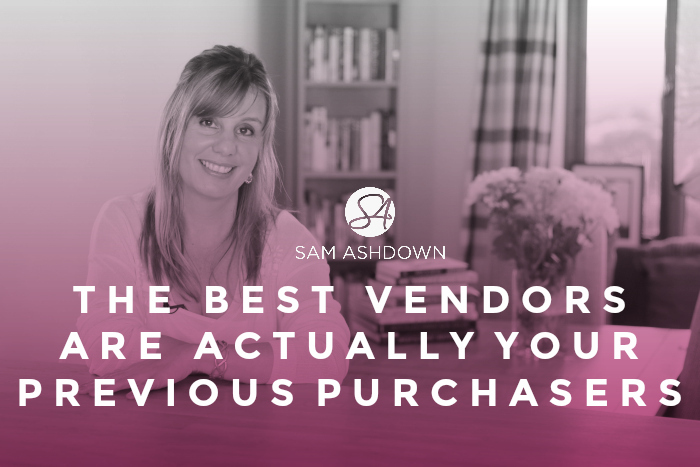 In short, and in general, leave your previous vendors alone and instead, encourage your previous purchasers with open arms – in a few months’ time they too will be previous vendors, and you’ll have to look elsewhere. What to read next: Can your ideal client please step up? Previous post What’s your big dream? Next post How do you get those WOW images?